I love this. The peeling paint really makes the shot. Ginnie Hart: Thank you, Michael. The peeling paint was an important part of Malta...because of the extreme weather conditions (heat, wind off the ocean, etc.). Ginnie Hart: Thank you, Peter. I "collected" these doorpost plaques while in Malta because they were everywhere and seemed to tell a story of the people there. Ginnie Hart: Well, then! Thanks, Ray. Ginnie Hart: Because Malta is a Catholic nation, Larry, these doorpost plaques are everywhere! Isn't this wonderful... I love the tones, and your framing, Ginnie! Merry Christmas to you! Ginnie Hart: Thank you, Elizabeth. This was such an important part of Malta and its people while we were there. The hundreds of doorpost plaques we saw really told a story about this wee nation. 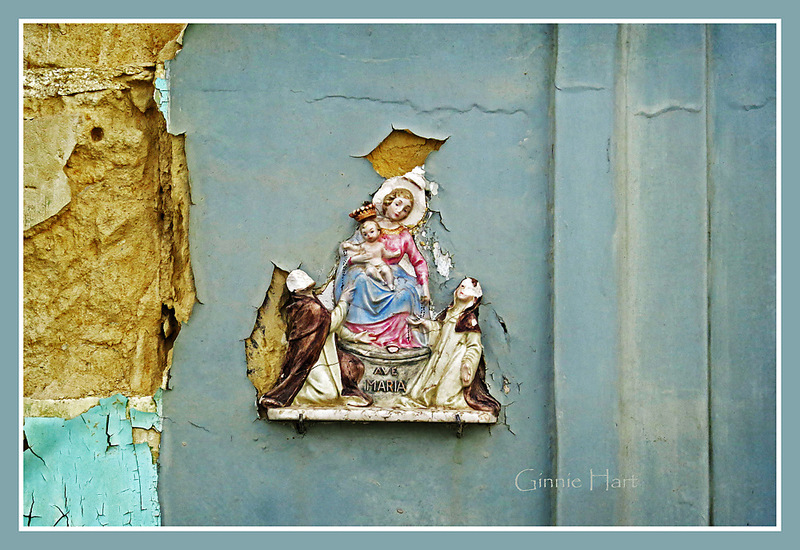 a lovely find, even with the defaced figure and the peeling paint, Ginnie. i cannot pronounce that place. Ginnie Hart: Thank you, Ayush. I found these doorpost plaques to be so telling of Malta's people who are mostly Catholic, of course. And yes, that place is still hard for me to pronounce, even now. It took lots of practice. I so love the Wabi Sabi feeling of this. Love the peeling paint. Ginnie Hart: Thank you, Astrid. So much of Malta looked like this, which I will never forget! Oh, what a touching scene of Mary and her child - the crown seems to be to heavy for the little 'un. Merry Chrsitmas to you and Astrid! Ginnie Hart: Bedankt, Philine. Midst the chaos and decay going on in our world right now, we do need signs of hope, don't we! I fear that this continue to crumble away like the building. Maria is being worshipped by the faceless ones! Ginnie Hart: This erosion/decay is so typical of everywhere we went in Malta, Alan, because of the severe weather wreaking havoc, especially on buildings. Painters would have constant work for the rest of their lives there! Just about hanging on in there.. I can imagine you going round looking for these plaques, Ginnie, and the exclaiming when you found another!! Ginnie Hart: I did a series of posts on these plaques awhile back (on In Soul) because of how they grabbed me, Lisl. Like cemeteries, they tell so much about the people and culture. Ginnie Hart: In spite of the harsh weather conditions, yes, Claudine! Merci. A lovely depiction of the Queen of heaven Ginnie. I like the broken wall around nd could have taken this myself. Ginnie Hart: This tells you so much about this place, Chad, especially the harsh weather conditions! Ginnie Hart: SDid you ever see The Mists of Avalon, Elaine. OMG! I've never seen it better shown how the goddess worship became Mary worship. Seriously. Wat een prachtig mooie muurscpulture van Maria en kind (ondanks toestand). Ginnie Hart: Bedankt, Marjolein. In spite of all the decay here, there is still a ray of hope. A great find set off so well by the crumbling surrounds. Ginnie Hart: Thank you, Bill. The weather has definitely taken its toll in Malta! Oh, the damage on the heads! Are you not going to be with us for Christmas? An early Merry Christmas to you then. Ginnie Hart: Since so many people celebrate Christmas over this weekend, Mary, I wanted to wish everyone a Merry Christmas NOW...and then again on Monday, of course. Thanks. A great find, Ginnie!! Perfect for this time of year. Merry Christmas to you!! What a beautiful little caricature. Ginnie Hart: I thought so, too, Brian. Thank you. Ginnie Hart: Thanks, Tom. Many of them all over Malta! How can you even remember how to spell such word? I can never remember how to spell the Mexican newt word, axolt or axolotl... Ha ha... I don't have auto spell-check. Don't you think Maltese and Mexican are rather similar? Ha! Ginnie Hart: HAHAHA! Leave it to you, LC, to think of these things! This is a great shot. The weather really got to the two woman at Mary's feet. Merry Christmas to you two, too. Ginnie Hart: Thank you, Louis. Leave it to the Maltese weather to play it's number. Now you know the wabi sabi - ness of this touches my heart! Gorgeous! Ginnie Hart: Yes, I do, Robin. I ALWAYS think of you when I see it.